With clinics in both San Carlos and San Francisco as well as multiple physicians and providers, Premier Dermatology is gaining traction as a go-to clinic in the Bay Area. In a nutshell, can you tell us more about your background and how did you get to where you are? I went into medicine to “save” the world. I had travelled and worked in developing countries such as Mexico, Cambodia and Kenya and had hoped to do the same as a medical doctor. Unfortunately, life takes you in different directions. After getting married at a young age and having kids, you realize that it’s harder to travel and live abroad. I did, however, pursue Internal Medicine and wanted to continue in primary care. During my Internal Medicine residency, however, I took an elective in Dermatology and fell in love with the field. I loved the fact that in dermatology, I got to see all age groups, see quick results and was able to work with cool “gadgets” as well as do surgery. After finishing Internal Medicine, I did a residency in dermatology. After completing my residency, I moved to California and after working a few years with other dermatologists decided to open my own practice, which is called Premier Dermatology. What are the opportunities that you have as a female physician that male physicians don't have? Do you feel that you have (or not have) a competitive advantage with female clients? I found that as a female physician, I understand how women feel about their struggles with their skin as well as the aging process. I am empathetic and see what they want. How is your clinic organized? How does it operate? Who runs your clinic? What types of services do you offer? What is your patient population like? We have 2 locations in the SF Bay Area. We have doctors, nurses as well as Physician Assistants. We also have aestheticians that provide aesthetic services. We do approximately 60% cosmetic dermatology and 40 % medical and surgical dermatology. We also have the most innovative treatments with lasers and other devices to treat skin conditions such as photodamage, rosacea, psoriasis, vitiligo, unwanted hair & tattoos as well as treatments for skin tightening and body contouring. My biggest roadblock was the lack of experience in running a business. I overcame it by joining business groups like EO (Entrepreneur’s Organization) and learning from other business owners and finding best people who can help me like lawyers, other business owners and a good CPA. We provide the most innovative treatments out there as well as understanding the female skin and ethnic skin. I wrote a book called “Asian Beauty Secrets.” I am also willing to try new and innovative business strategies that most doctors don’t do. How successful are your marketing efforts? We do everything possible to be at the cutting edge of marketing. Recently this includes doing a social media campaign with facebook, twitter and Instagram. Is there any technology that you're looking to purchase in the future? What do you look for in deciding which technologies to purchase? Currently we are well equipped with the latest technology. We attend lots of scientific meetings as well as learn from other colleagues which treatments actually work and are well received by patients. There are definitely technologies that are oversold and I have bought into them only to be disappointed with either results or patient tolerability. Some of these over the years have included the Syneron Fotofacial, Photodynamic Therapy and Thermage. Where are the most promising areas of research in dermatology? Are there any areas that look especially promising or that you think are over-hyped? The promising areas of research include new topicals for acne vulgaris, and machines for body contouring and skin tightening technologies. I am always inspired by other entreprenuers. Where do you see dermatology moving and are there any treatments that have the possibility of displacing current medical technologies? Unfortunately, with decreasing reimbursements many dermatologists are forced to do more self-pay or concierge type of medicine and do procedures that do not require medical reimbursement. What have you learned about business that has helped you the most? What experience would you attribute your clinic's success to? The most helpful thing that I have learned in business is when you think you have a big tragedy or loss (such as losing a key employee) that everything always works out. It’s important to keep a positive attitude. You have to keep going even when things get tough. 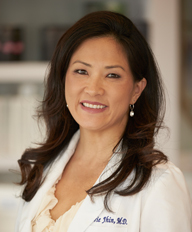 Dr. Marie Jhin is a board certified dermatologist, Asian Skin expert and the director of Premier Dermatology. She has been featured on numerous magazines including Seventeen, Oprah and New Beauty magazine as well as on the local news, TV shows, infomercials, newspapers and on the internet. She is a fellow of the American Academy of Dermatology, American Society for Dermatologic Surgery and member of the Women’s Dermatologic Society. She has been rated as America’s Top Doctor for the past 3 years and is on the Who’s Who list. She is the recipient of the Asian Women in Business Entrepreneur Leadership Award in 2011. She was an adjunct clinical instructor at Stanford University from 2000-2011.She is on staff at Sequoia Hospital and California Pacific Medical Center. Dr. Jhin is the author of a new book titled “Asian Beauty Secrets”.